The force’s senior officer for roads policing said elderly pedestrians are at particular risk during this severe weather. Chief Superintendent Murphy said braking distance will be "several times the distance it normally would be to bring the car to a stop". GARDAÍ HAVE REPORTED an increase in minor collisions today and have advised people to avoid making journeys today unless they are urgent. Speaking to TheJournal.ie, Chief Superintendent for Roads Policing Finbarr Murphy said all road users and pedestrians need to be “extra cautious” today if they are out. “We have had an increase in small level, minor collisions today,” he said. He said pedestrians should not take chances running across roads as they may lose their footing and cars driving near them will take longer to brake. Drivers need to be aware, he said, that their braking distance will be “several times the distance it normally would be to bring the car to a stop”. Chief Superintendent Murphy said this also applied to pedestrians who may walk out in front of a car while taking photos and videos of the snow. “For drivers, we’re advising they clear all the snow off their roofs before they start their journey as the whole sheet will come down onto the windscreen if you have to brake suddenly. Also, when clearing the snow off the windscreen, clean the whole thing, not just where the wipers are. Email “Gardaí warn of increase in minor collisions as they advise people to stay home if possible”. 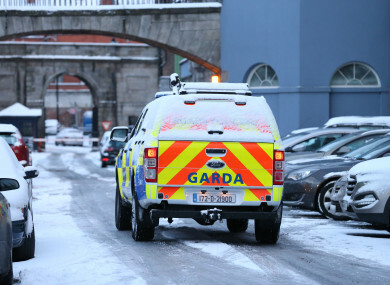 Feedback on “Gardaí warn of increase in minor collisions as they advise people to stay home if possible”.